While my business is verrry niche, I do still have competition just like any business does. "Customers" could mean donut-buyers if you're a donut shop owner, patients if you're a doctor's office or hospital, donors if you're a non-profit organization, or it could mean small businesses in general, if you're a business consultant like me. All businesses are vying for your customers' attention, no matter what it is that you're selling. The truth of the matter is, there's ALWAYS a business that's bigger, better, faster, more, easier, yummier, cheaper, healthier, blah blah blah, than your business. But I don't worry about my competition. And you shouldn't, either. By using a technique called the Blue Ocean Strategy (a business philosophy developed by and book written by W. Chan Kim and Renee Mauborgne), you differentiate yourself in such a way, your competition is completely irrelevant. I highly recommend reading the book, but I'm going to break it down in a few simple steps below for you to get started. First, you have to be very clear on the values and offerings of your business, particularly those that you feel separate you from your competitors. Jot those fundamentals down. Second, think about your primary competition and jot down what you believe to be their priorities/values/offerings. Third, create a simple chart with the X axis being the list of those fundamentals and the Y axis indicating "low" to "high," regarding how important that value is to your business or your competitors' business. Fourth, plot on the chart where you believe your priorities fall, low to high, and then plot where you believe your competition's would fall. (I use two different colors of pen for this exercise, so I can really see the difference). The idea is that you will discover -- and then hopefully capitalize on -- the differences that you bring to the table versus your competitors. 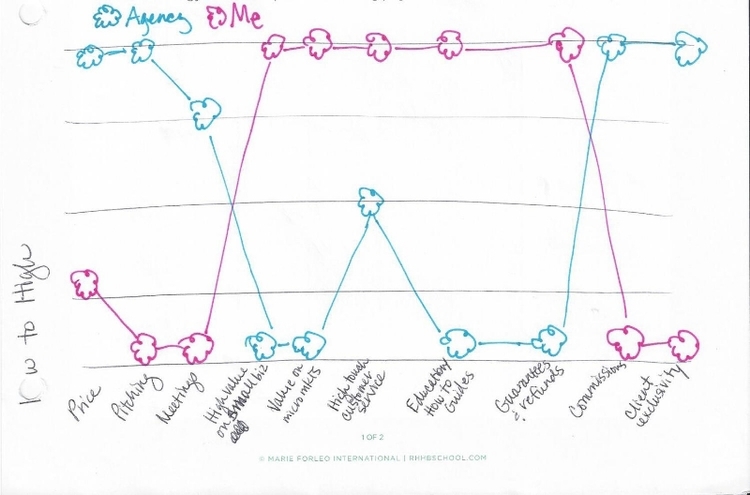 To illustrate this for you, I'm sharing below my very own Blue Ocean Strategy chart, which I completed early this year as I went through Marie Forleo's B-School. I needed to hone in on how my business would be different from my competition (in this case, ad agencies). I also have one showing how Braziel Media differs from marketing freelancers, which is another business model that I consider to be my competition. When you finish the exercise, your end result will hopefully look something like my chart, above. As you can see, my priorities and offerings are almost completely opposite of those of ad agencies (typically). For example, my business model is such that I can offer a much lower price point than an ad agency can. 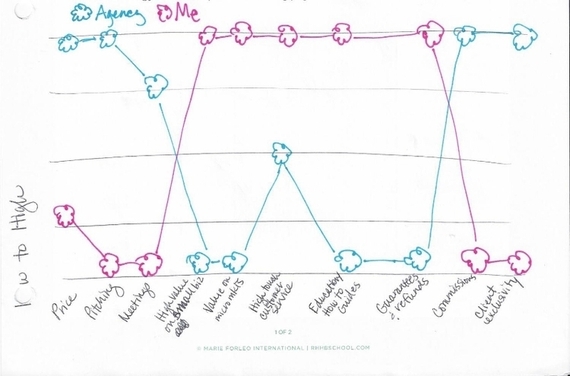 My chart also shows us how "pitching" is an important and consistent element in the ad agency's process, whereas my business doesn't participate in business pitches at all. My business places a high priority on small businesses, where ad agencies are typically (not always) geared toward large businesses with huge advertising budgets. Now: what to do with this information? Take action: Create your own Blue Ocean Strategy chart, identifying key focus areas of your business and how they differ from those of competing businesses. The areas of differentiation on your chart indicate why your competition is moot. These are the areas you need to capitalize on and market the hell out of. Now you just need to get out there and do it: Market that beautiful secret sauce of yours. This article originally appeared on BrazielMedia.com, where the author uses her blog to illustrate how businesses regularly leave marketing money on the table and shows them ways to get those dollars back.